I am not a gardener. I actually have 2 brown thumbs. Although this past spring, I made a little effort to clean up my yard and plant a few things. I read that Coleus were hard to kill which makes them perfect for me. The price tag and variety at the local garden center made it difficult to bypass. 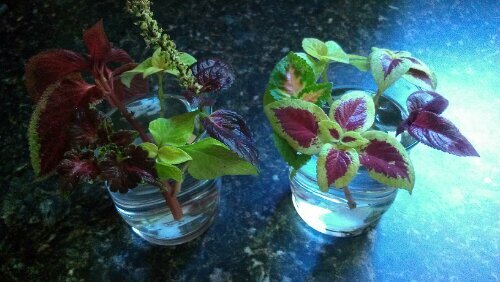 As I was watching all if the leaves start to turn brown on the trees, I got the urge to try to bring some of the coleus inside to start new plants. Here they are, a few pieces from all of the different varieties waiting in water for roots to grow to spend the next 2 seasons inside. Maybe we should all take some time to think about how we want to grow and start nurturing the roots of our future selves now! I love Coleus. I have had better luck putting the cuttings in potting soil when overwintering. Type in Rosy Dawn Gardens. They are an AWESOME Coleus specialist and their website is great. They give a lit of tips on growing Coleus. All the photos will blow your mind!